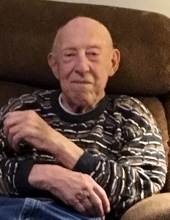 Fritz, Edmund William, age 91, passed away on March 22, 2019 in Grand Rapids. He was born on April 16, 1927 in Detroit to the late Clifford and Lucy Fritz. Beloved husband of the late Barbara Jean Fritz whom he married on June 26, 1948 at St. James Catholic Church, Ferndale. Loving father of Frederic Fritz of Higgins Lake, Gary (Sandra) Fritz of Grand Rapids, Patricia (Michael) Debus of Grand Rapids, Janet (Peter) Oravetz of Pleasant Ridge, Robert (Mary) Fritz of armada and the late John Fritz. Dear grandfather of 14 and great grandfather of 7. Caring brother of the late Clifford Fritz, the late Charles Fritz and the late Raymond Fritz. He will be dearly missed by many nieces, nephews, relatives and friends. Visitation, Tuesday from 3:00 p.m. until 9:00 p.m. with Scripture Service at 7:30 p.m. Sawyer Fuller Funeral Home 2125 12 Mile Rd. Berkley. Funeral, Wednesday - Instate at 10:30 a.m. until the time of Mass 11:00 a.m. Our Lady of La Salette Roman Catholic Church, 2600 Harvard Road, Berkley. To send flowers or a remembrance gift to the family of Edmund William Fritz, please visit our Tribute Store. "Email Address" would like to share the life celebration of Edmund William Fritz. Click on the "link" to go to share a favorite memory or leave a condolence message for the family.